Above image: Jim Cooke, GMG. We made it! I appreciate everyone’s efforts in making the National Prison Strike a national headline for three weeks. Your solidarity and support has been a huge reason why the NPS flooded the media and transformed the national narrative surrounding prisoners’ human rights. While the symbolic end date of the national prison strike past on Sunday’s 45th anniversary of the Attica Uprising, prisoners take the lead in determining whether to continue striking depending on their individual circumstances at their institutions: some extending the call, others placing a new date on their call and even striking indefinitely. 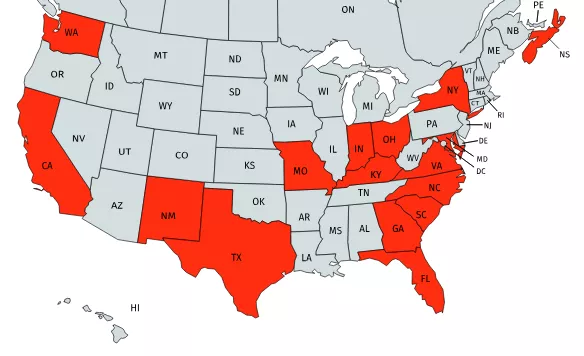 We know that during the strike many institutions were unable to advertise their actions to the public so I will be continuing to update the participating states page with all of the confirmed actions sent into JLS associated with the National Prison Strike. Below I’ve included a map from the most recent reportback from the strike. Not only did this prisoner led movement do an incredible job of raising awareness across the world about inhumane conditions in US prisons, the national prison strike miraculously worked to combine organizational efforts from around the country of groups de-structuring the nation’s mass industrial prison complex. We were able to combine the power of hundreds of organizations that are committed to ending mass incarceration in the United States. Knowing that ending mass incarceration is a monumental effort, it requires a monumental force. It is incredible to see everyone’s regional efforts because in order to effectively destroy this Beast that we are fighting against we must continue to work together. This is why I invite us all to continue to collaborate in the spirit of the national prison strike which effectively demonstrated on a massive scale prisoners’ leadership in organizing efforts against mass incarceration and resolving the inhumane conditions that they are forced to live and work in. We must continue to support them as the threats of retaliation are still real and continue to persist beyond the strike dates. Incarcerated leaders like Jason Walker continue to suffer from abusive treatment and staff harassment, Imam Hasanhas been placed on a one year ban from outside communications and Kevin Rashid Johnson just went up for another transfer trial and is being sent for another out-of-state transfer. They are shipping organizers like cargo and JLS members are being hunted like animals as officials try to pluck them out of general population and tear them down due to the amazing work that they were able to to complete these past few weeks. This country is in desperate need of the force that the national prison strike and it’s solidarity groups represents! Just these past couple days I’m sure we’ve all heard of the hurricane on its way in South Carolina where officials are refusing to evacuate prisoners. This isn’t something that a few South Carolina based organizations can handle on their own as effectively as a coalition of hundreds of organizations. This is one of the many pressing issues that prisoners need our support on in order to powerfully address and in the spirit of their strength and bravery that they demonstrated during the NPS we must continue to stand with them. This movement needs a powerful coalition. The Millions for Prisoners (M4P) human rights Coalition, which took on JLS’ call for Action last year by hosting the Millions for prisoners Human Rights march at Washington DC, will also be hosting JLS actions in support of the strike’s demands. Jailhouse lawyers speaks has confirmed that they will be hosting another National Prison Strike in 2019 to continue to push for any of the demands that have yet to be fulfilled by that time. Jailhouse Lawyers Speak has also confirmed that they will be hosting another march with M4P to kick off the strike next year. Jailhouse Lawyer Speaks has also confirmed that I will continue to work with them and act as their spokesperson in collaborating with outside organizers, responding to the media and communicating their needs to endorsing groups and organizations willing to continue to take action until every single one of their demands are achieved. Many people have been anxious to know how we will be moving forward. In addition to the formation of the Prisoners’ Human Rights Coalition, JLS has developed a petition in collaboration with KOS that is being circulated nationally. The online petition sends a letter in support of their demands to the United States’ Congress. Already over 14,000 signatures have been collected and over 14,000 letters to policymakers have been sent. I encourage you to add yourself and circulate this petition among your own networks. This petition is a critical aspect to the fulfillment of prisoners’ demands because we cannot expect legislators to make changes to our criminal justice system if they do not know exactly what we are asking for (what prisoners are asking for through us). We are no longer asking for light reforms, we are demanding a transformative change led by the incarcerated individuals whose lives depend on those changes. Each signature sends a letter to members of Congress demanding that they respond to prisoners’ demands and support the strike’s criminal justice changes. Online petitions educate legislators and the public and require policymakers to respond. We must continue to use every resource that we have to educate legislators about these demands so that we can hold them accountable for the required policy changes. I want to thank every single person working on behalf of prisoners not only during the two and a half weeks of the strike but as the struggle continues. Prisoners have brought us together in this fight, empowering us through their strength and boldness. I’m excited to continue to work with you all as we form a coalition in committed to the achievement of all of prisoners’ demands which they more than deserve after their selfless sacrifice as leaders and participants in the National Prison Strike. Please stay tune and connected.